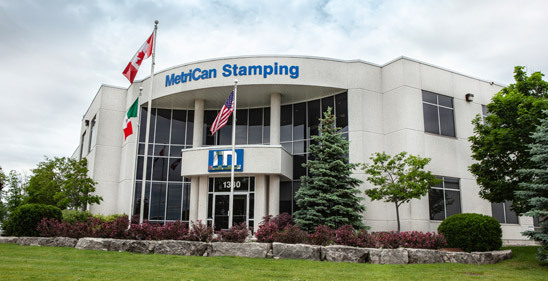 MetriCan Burlington is a 100,000 sq. ft modern facility that was built in 2001. In addition, the Burlington facility is equipped with 3 overhead 15 Ton cranes and up to 60,000 lb lift capacity material handling equipment. This location also has 7 docking bays, and 1 drive through bay. Equipped with Press lines ranging in size from 65 tons – 1320 tons, including a Linear Transfer system. Assembly processes include various technologies, such as Robotic Spot Welding, Resistance Nut Welding, Robotic Mig Welding, and Orbital Riveting. A Quality Management System, making Customer Satisfaction, Continuous Improvement and Cost Reduction our primary objective. Presses ranging from 65 – 1320 Tons. Resistance, Projection and Mig welding cells. Orbital Riveting capabilities. See equipment list for details.